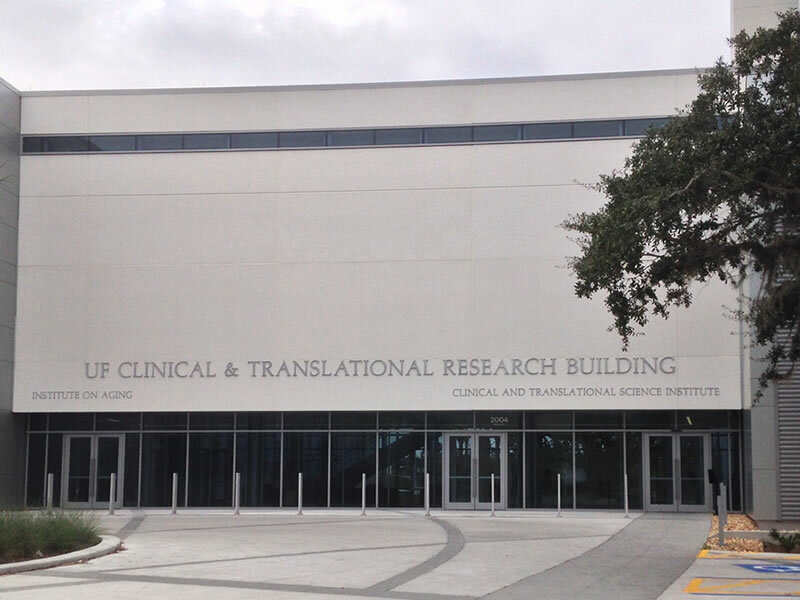 Located within the Health Sciences District at the University of Florida, the Clinical Translational Research Building (CTRB) serves as the major catalyst for developing models and synergies in aging and geriatric medicine research and education, muscular dystrophy, diabetes, and health care across all Colleges and Departments at the University. 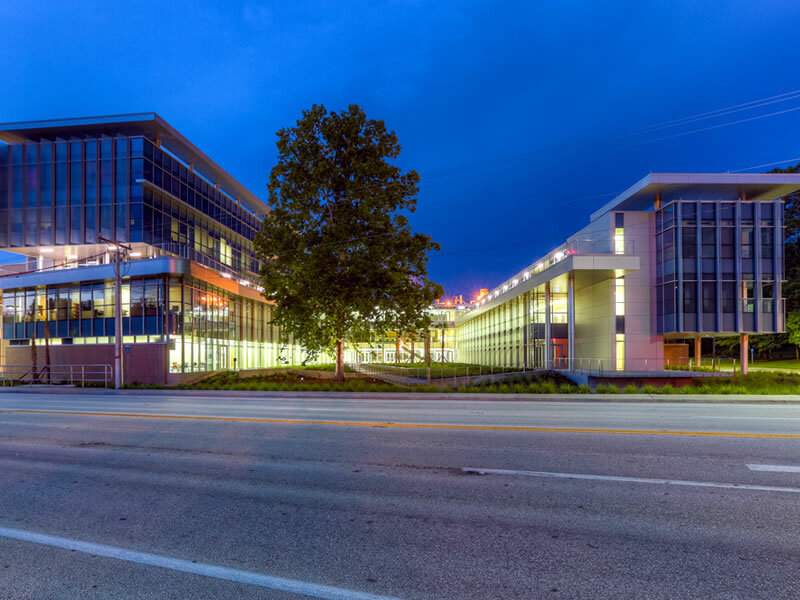 At 120,000 SF, the CTRB is the home of the Institute of Aging (IOA) and the Clinical Translational Sciences Institute (CTSI). 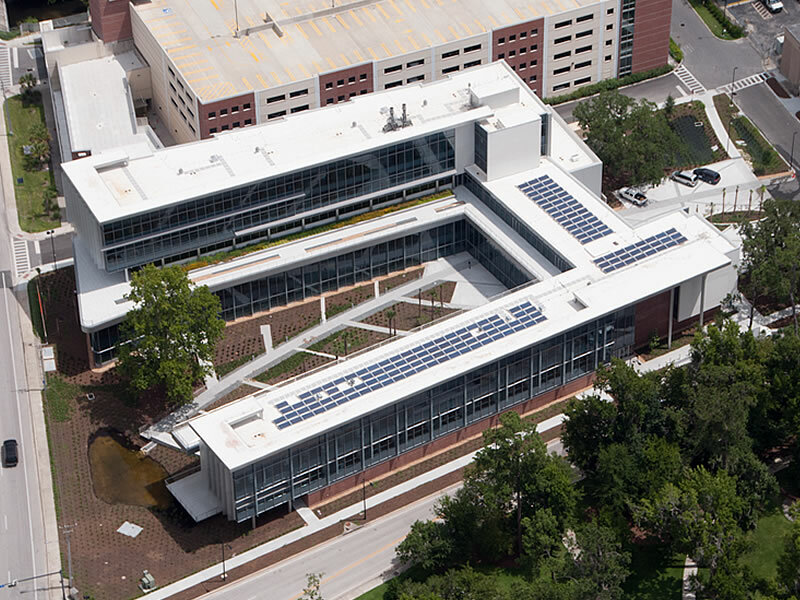 The CTRB building combines clinical spaces, dry labs, research and office space for various departments in the Colleges of Medicine, Nursing and Public Health and Health Professions. The CTRB is constructed of composite steel beams and steel columns bearing on a deep foundation system comprised of 16” diameter augercast piles. The lateral force resisting system consists of composite steel deck and metal roof deck diaphragms which transfer lateral load to the vertical lateral load resisting elements including concrete shearwalls and braced frames at select locations. Often there are unique challenges to be faced in the structural design on buildings. With the use of current coordination technologies such as Building Information Modeling (BIM), these challenges can be identified early in the design phase. The CTRB did not disappoint with its own set of unique challenges. Story height restrictions in combination with a raised floor slab system required that the design of the structural steel framing minimize beam and girder depths to maximize usable ceiling space for other trades. 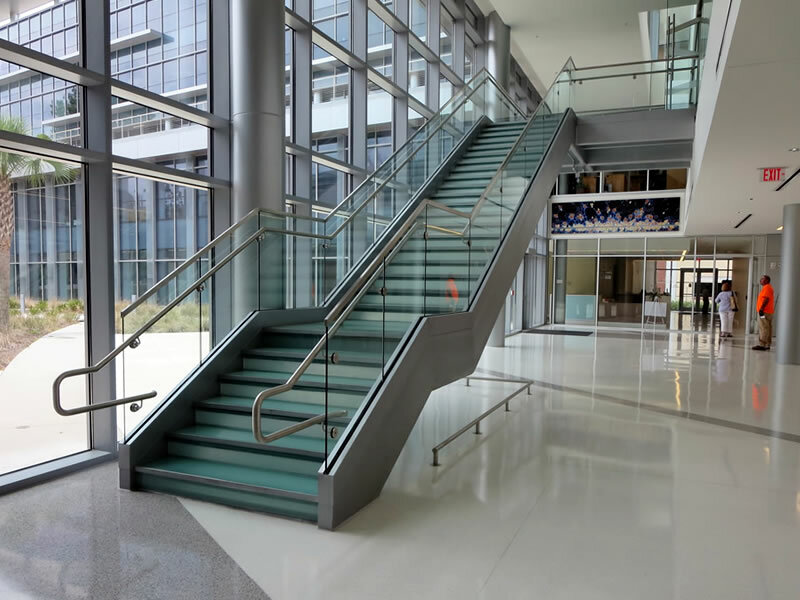 Due to the large cantilever steel girders over the Main Lobby and Conference area, a greater girder depth could not be avoided in order to keep deflection within the allowable limits. To accommodate mechanical duct work, large web penetrations were required. A vierendeel truss approach was utilized in the design of the W-shape girders with reinforced web openings. Another challenge was the irregular geometry of the building which required that the building be separated in three different locations by expansion joints. To maximize usable floor space, slide bearing connections were used rather than dual columns.